Designed for all weather conditions play your games in style just like Luis Suarez, Thomas Lemar and Gareth Bale with this Nike Merlin La Liga Match Football in a White, Chrome, Total Orange and White colourway. This Nike Merlin match ball has been crafted with optimal touch and total flight control. This is the first ever Nike ball with ACC (All Conditions Control) technology and is the new ball for the 2018/19 season and beyond. Nike has integrated All Conditions Control (ACC) into a football to provide optimal touch and control in all weather and pitch conditions. 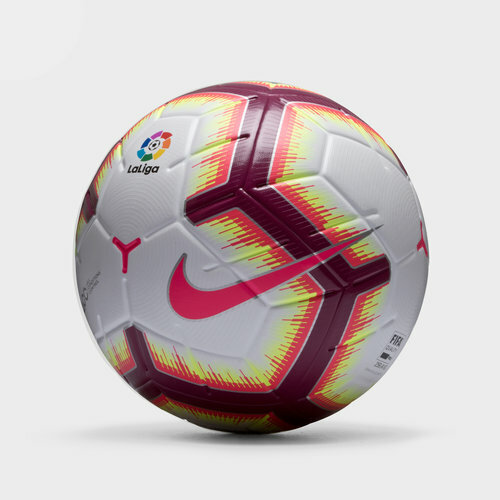 It incorporates advanced design, materials and construction that make it worthy of being the official ball of the English Premier League, La Liga and Serie A. This football has been constructed of a latex bladder enveloped in proprietary materials to promote more consistent air pressure and keep its shape. Debossed grooves and 3D inks rise as they dry during the printing process further improve aerodynamics and the feel of the ball.